Which Should Air First — Wheel of Fortune or Jeopardy? 63 percent of TV stations in the country air Jeopardy first. 37 percent air Wheel first. Who’s right? As readers will know because I bring it up like three times a week, I grew up in the Cleveland, Ohio area. And all throughout my childhood, my parents and I would watch Wheel of Fortune at 7:00 and Jeopardy at 7:30. So when I moved to Los Angeles and found the order flipped — Jeopardy at 7:00 and Wheel at 7:30 — I wondered what kind of twisted, unnatural place this really was. It might’ve been my biggest moment of culture shock in moving to L.A.
Little did I know: L.A. is in the majority. The website GraphGraph did a study a few years ago and, while I’m sure a few data points have shifted a little, the broad strokes are still accurate today. 206 of the 210 television markets in the U.S. have a local station that airs Wheel and Jeopardy. And in 129 of the 206 (~63 percent), Jeopardy airs first. The map paints a fascinating picture; it almost looks like the inverse of a the standard election maps. Wheel airs first in almost the entire Eastern time zone, through Mountain time, and in some pockets on the West coast. Almost the entire Midwest has Jeopardy first. There’s a reason tests start with easier questions and build toward harder ones, or fight cards have an undercard and a main event. Basic logic tells us entertainment needs to ramp up, not peak then decline. Wheel of Fortune is a more successful show, much in the way that PornHub gets more views online than The Journal of Negative Results in BioMedicine. It’s takes a lot less work. In TV, the top of the hour slot usually goes to the higher-rated program, with hopes that the subsequent program will retain as much of the audience as possible. The Wheel–Jeopardy order gets everyone’s confidence up. Solve a few Wheel puzzles, shout at the TV about how the morons up there keep buying vowels when it’s so totally obvious the Before and After is “Jason Alexander Hamilton,” and next thing you know, you’re totally empowered to dominate Jeopardy, Rosie Perez style.
. Wheel has the more attractive contestants. Operating under the assumption that people are wrapping up dinner at 7:00, that’s a better digestif. The Jeopardy interviews are consistently among the most awkward moments on television every single day, and virtually all of the blame goes to Trebek’s stilted interviewing style. Sajak is much more relaxed and plows through the interviews quickly and efficiently, to keep viewers from abandoning the game show block altogether to flip over to syndicated American Dad. Seriously, why did the rest of you even bother having childhoods?
. We live in a time when anti-intellectualism is widely considered a virtue. So forget Jeopardy at 7:00 P.M., I say bury that elitist fact-based propaganda at 4:00 A.M.
Wheel ends on a downer note more often than a high note; the final puzzle is more likely to result in a loss than a win. And then Sajak opens that envelope with the prize the contestant would’ve won, just to salt the wound. Jeopardy, on the other hand, is structured so it’s guaranteed to end in a victory, and often a tight one. That uplifting scenario is more likely to make someone want to continue watching game shows. Not exactly true. Older people still do. And you know what they watch before the game shows? The national news. Which really begs for a light palate cleanser afterward. If every station aired these two shows in a uniform fashion, people like me and the people who made those graphs could stop devoting their brainpower to this, the inanest of inane debates, and focus on more productive things. And since Jeopardy airs first in more markets, fewer stations would have to switch to achieve a homogenized game show block. 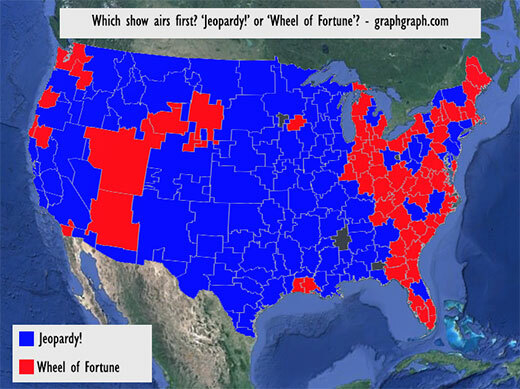 Results: Wheel of Fortune should air first, 7 – Jeopardy should air first, 4. So, uh, get on that, TV stations. 11 Comically Bad Answers on Who Wants to Be a Millionaire?